Cooking good food from scratch and other delicious aspects of life! The recipe has been figured out! I found several versions of the recipe, but none had rum in it…after some checking around and looking hard at my mom’s handwriting, I was able to decipher the rum was used to soak the raisins before adding to the recipe, also, I did make some changes in the directions and order of ingredients, but the recipe is basically the same as the one my mom wrote. This recipe was much used with many blotches and even some flour and grease stains on the paper. If you are a raisin lover or not I think you will enjoy this recipe…it is easy, rich, decadent, and delicious! Pre-heat oven to 300. 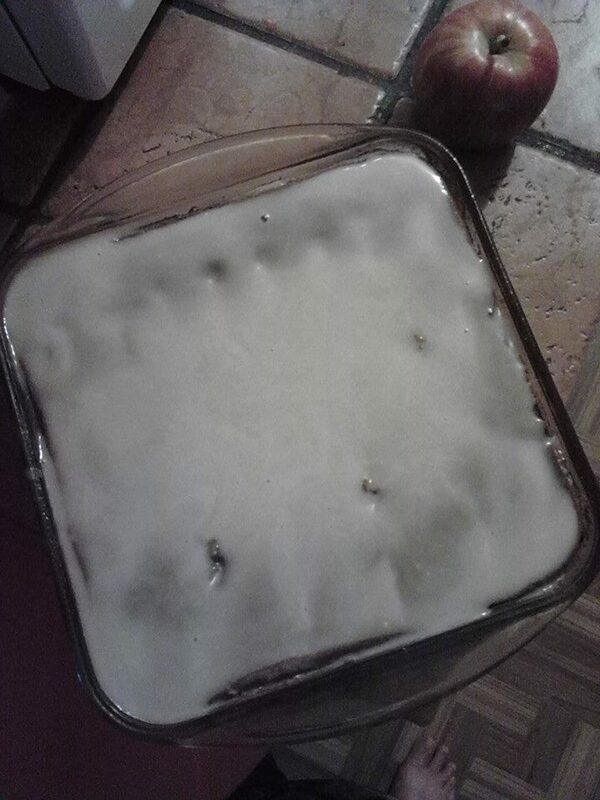 Prepare baking pan, square 8 x 8, by buttering and flouring. 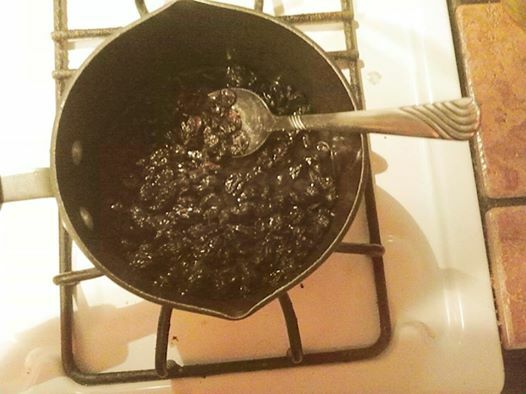 Put raisins and rum in small pan and heat to warm rum, then set aside for 1 hour for raisins to soften and plump. 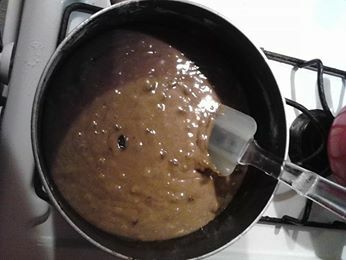 Combine brown sugar, molasses, water, orange juice, butter, and shortening in pot large enough to hold all ingredients, add raisins (you can drain raisins, but I add what little liquid is left in pan.) 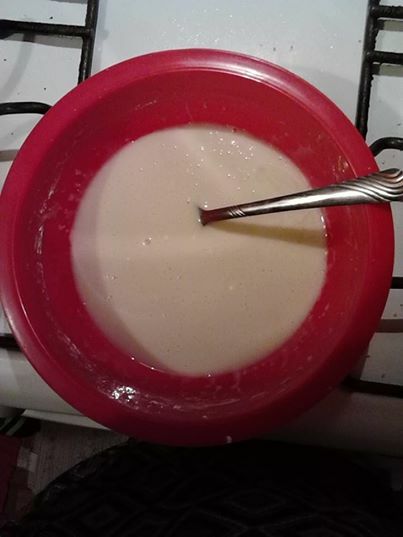 and bring to a boil, boil for 4 minutes. Remove heat and cool completely. 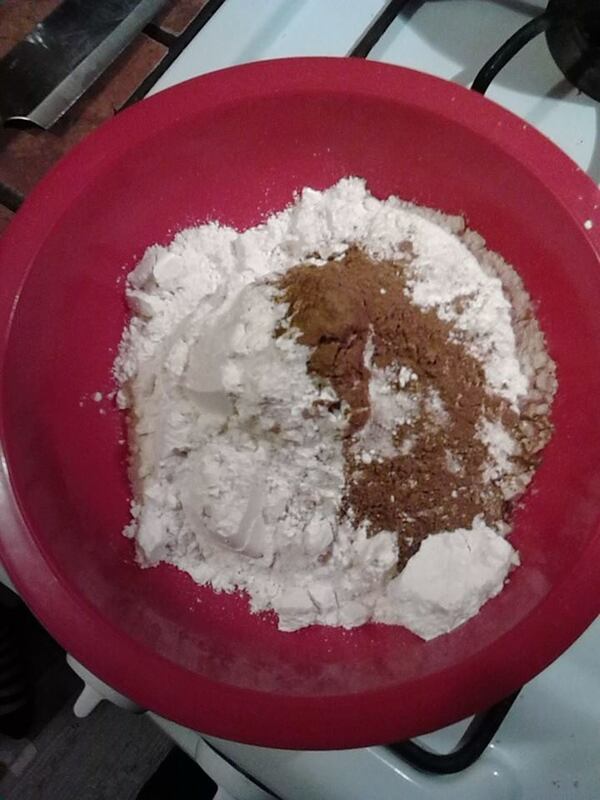 Sift flour, baking soda, baking powder, cinnamon, soda, nutmeg, and salt together. 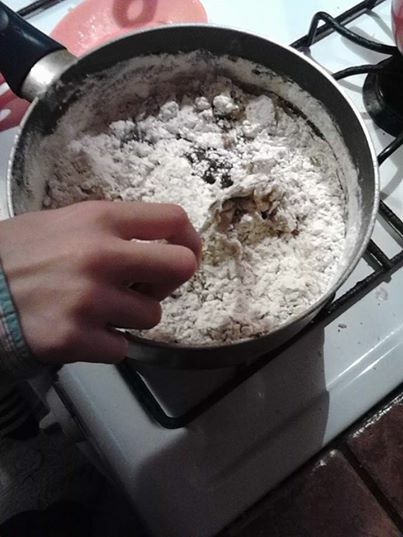 Stir into cooled raisin sugar mixture and mix until smooth. Add walnuts if using. Pour into the prepared baking pan. 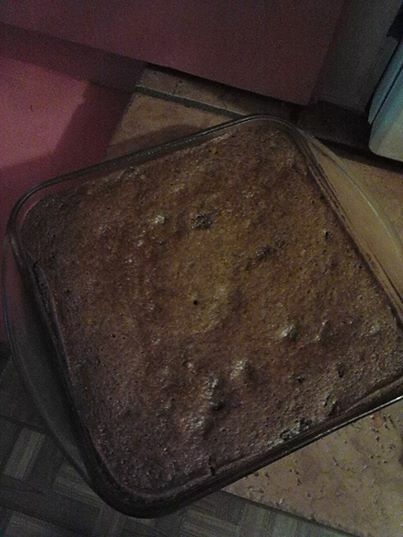 The recipe called for 1 1/2 hours back time,but with my oven it was only 45 minutes, test with toothpick inserted, if it comes out clean cake is done, if not bake a few minutes more and test again. 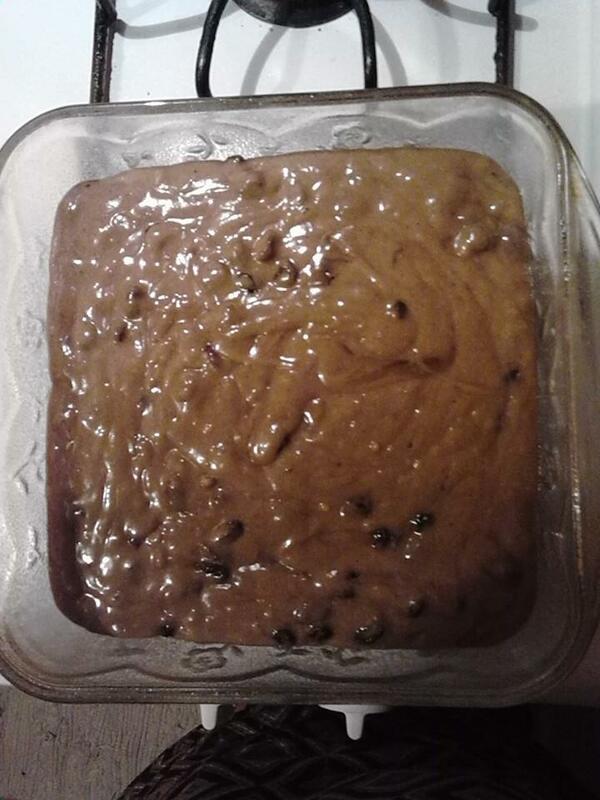 Cake will appear sticky/moist on top. Let cool 10 minutes in pan then gently remove to wire rack to cool. Can be served warm or wrapped and stored in fridge over night. Bring to room temperature or warm in low oven if you prefer. 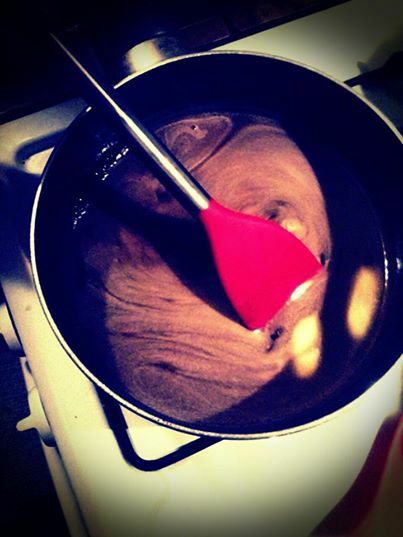 Whisk together till smooth then pour over cake. 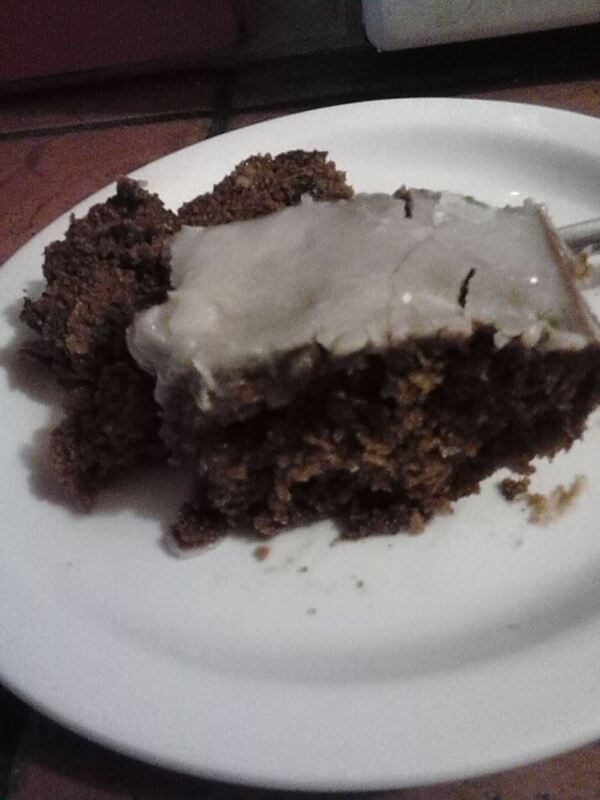 My family prefers vanilla flavored glaze so I used milk and vanilla extract. Can also glaze cake when hot out of over, we love it this way. 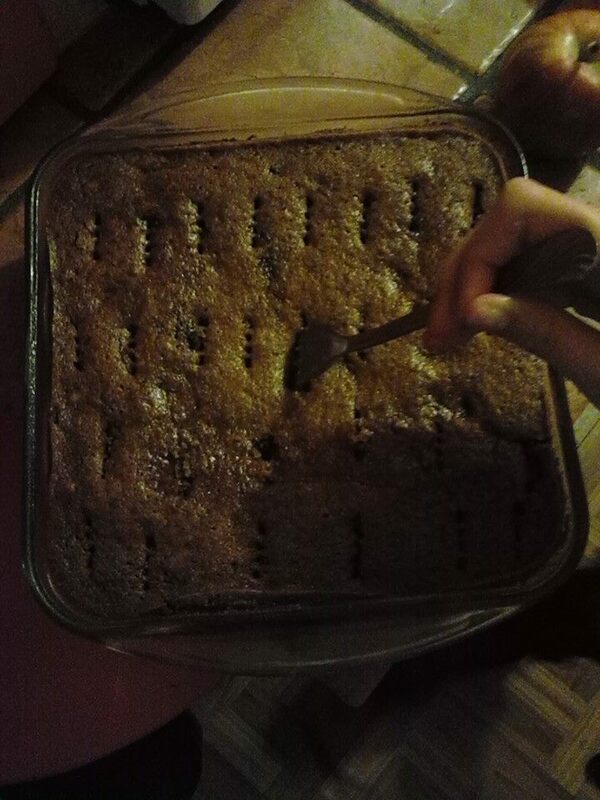 Sometimes mom would take a fork and poke holes all over the cake. The glaze would soak in and was very delicious. This is my preferred method. Can keep up to 1 week in fridge, but it never made it passed one day in our house! Make this and make it soon! Great cake for holidays and other special occasions. You won’t be disappointed, in fact, you will want to eat every crumb off the plate, definitely finger licking good worthy! !